It was the ultimate game of cat and mouse. Jasper and Jinx in the beginning. While working for Metro-Goldwyn-Mayer, William Hanna and Joseph Barbera were paired up in a desperate move by MGM to recover from the financially disastrous series of shorts the studio ran based on the Captain and the Kids comic strip. Figuring a good short would have conflict, chases and action, Barbera conceived of a concept with a built-in, classic and recognizable conflict: a cat chasing a mouse. Initially, Hanna and other MGM staffers had no confidence in the project, feeling the concept was unoriginal. However, the short was made and in 1940 Puss Gets the Boot was released to theaters. In it, cat Jasper sought to capture mouse Jinx, but was threatened to be tossed out if their antics broke anything in the house by his owner Mammy Two-Shoes (Lillian Randolph); an African American housemaid. When the short proved a success and was nominated for the Academy Award for “Best Short Subject: Cartoons,” Hanna and Barbera were pulled off their other projects and commissioned to work on a series featuring the characters. Holding a competition amongst their colleagues to come up with new names for the pair, John Carr ultimately won with the suggestion of Tom and Jerry. Tom’s designed was altered and streamlined as the series went on, changing him from a realistic cat to anthropomorphized, and reducing the amount of detail in his features. Jerry, however, changed very little. 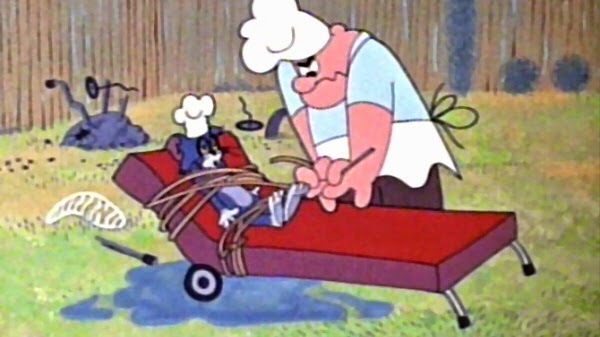 Although the essential plot was always the same (cat chases mouse, mouse beats up cat), Hanna and Barbera’s talents allowed them to find variations on the theme; altering the locations and elements of the chases. The shorts became known for including some of the most violent cartoon gags to ever appear in theatrical shorts, from the range of weaponry Tom used (axes, hammers, guns, explosives, poison) to the instruments of retaliation Jerry countered with (electrocution, slamming Tom’s head in a window, dropping an anvil on him, etc.). 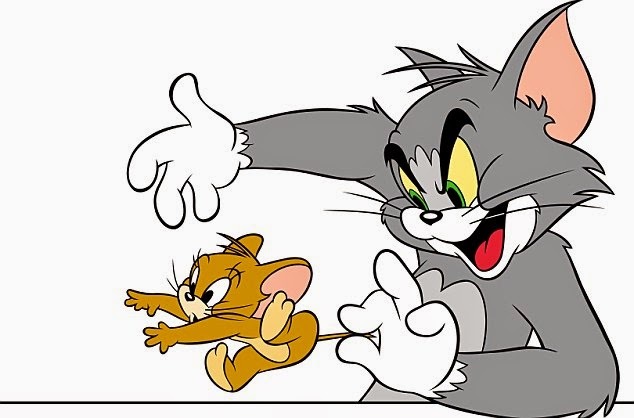 Jerry’s actions in particular were the most violent since Tom was usually on the receiving end, whereas Jerry’s cunning allowed him to avoid most of Tom’s machinations. The energy and violence gradually increased when Hanna and Barbera took inspiration from the work of Tex Avery, who joined MGM in 1942. 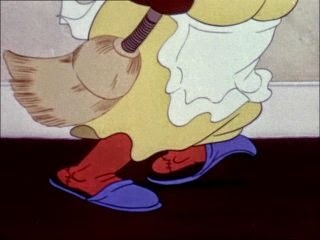 Mammy Two-Shoes going to clean up the mess from a chase. Notably, Tom and Jerry very rarely spoke outside of when a gag would have a call for one of them to have some dialogue (such as Tom crooning to a potential love interest). It was up to the minor characters to provide voices during the productions, otherwise the musical scores composed by Scott Bradley, which blended several genres together, was used in place of sound effects and to illicit emotions in various scenes. 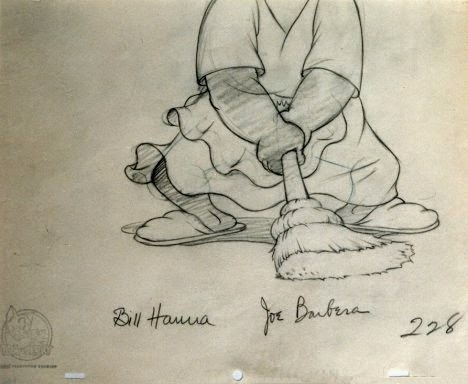 Production sketch of Mammy Two-Shoes wielding a broom. Minor characters featured in the shorts included, as mentioned, Mammy. Mammy was never seen above her shoulders except for a brief glimpse of her face in the short Saturday Evening Puss. 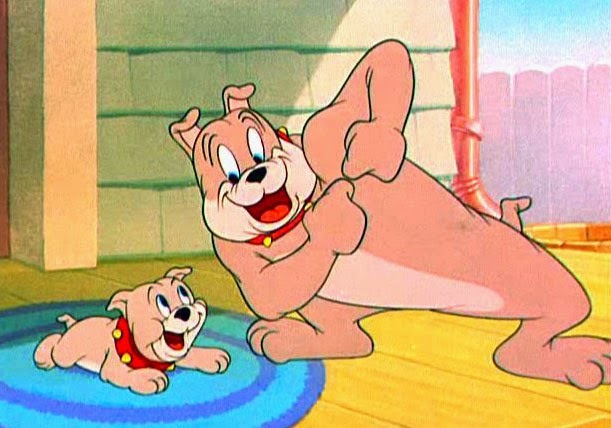 Spike (sometimes named Killer and Butch), first appearing in Dog Trouble (1942), and his son Tyke, first appearing in Love That Pup (1949), were a pair of bulldogs that Tom frequently encountered in his pursuits of Jerry. Spike started out as indiscriminately vicious, however usually attacking Tom. 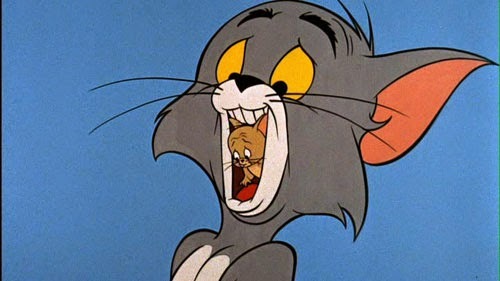 Gradually, he began to speak voiced by Billy Bletcher and Daws Butler in a Jimmy Durante-type voice, and was often incorporated into the shorts by Tom and Jerry’s antics spoiling something Spike was doing (and since he usually took it out on Tom, Jerry would set Spike off on purpose). Tyke, voiced by Michael Dobson, was introduced and softened Spike’s character a bit and gave Jerry a new weapon against Tom, as whenever Tyke would end up hurt by Jerry Tom would be on the receiving end of the punishment. Butch (Frank Graham) was a black alley cat who served as both Tom’s friend and his rival to eat Jerry or win the affections of attractive white female cat Toodles Galore. 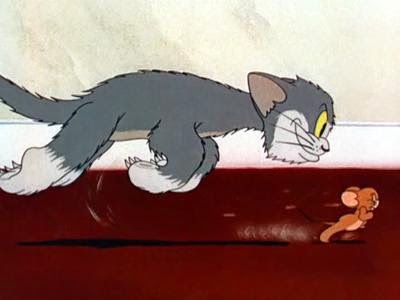 Both characters initially appeared in Hugh Harman’s 1941 short The Alley Cat before they were integrated into the Tom and Jerry series. A smaller diaper-wearing mouse, whose name fluctuated between Nibbles and Tuffy, was originally introduced in Our Gang Comics #1, 1942, before being integrated into the shorts with 1946’s The Milky Waif. 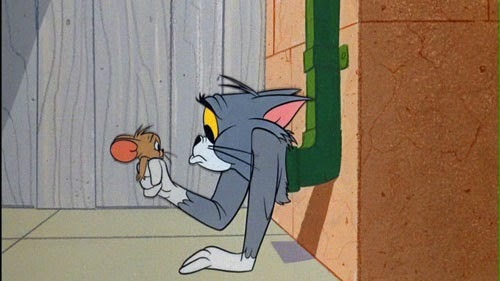 Originally presented as a peer to Jerry, eventually he was made into Jerry’s nephew in 1953’s Life with Tom. While the comic initially changed the name of its character to Nibbles to match the shorts, in 1957 the shorts officially changed the name back to Tuffy. He was voiced by Francoise Brun-Cottan and Lucille Bliss. Butch about to shoot Tom. 1950s budget tightening slowed the pace of the cartoons some, but the shorts continued to be popular. But when television began making a dent in box office receipts, MGM began to take money-saving majors. Primarily, they went to an all-CinemaScope production, but upon seeing their returns on re-releases of older shorts were the same as the new ones, the studio decided to close their animation studio down in 1957. 114 Tom and Jerry shorts were produced, with the last released the year after Hanna and Barbera would go on to open their own animation studio, Hanna-Barbera Productions. 13 of them were nominated and 7 won Academy Awards for “Best Short Subject: Cartoons,” making them the winningest characters in any theatrical-based animated series. The Deitch-era Tom with his new, more abusive owner. The moratorium was short-loved, however, as MGM revived the franchise in 1961. They contracted European studio Rembrandt Films to produce 13 new shorts at their overseas studios. The shorts were directed by Gene Deitch (who despised the original cartoons), produced by William L. Snyder, and composed by Štěpán Koníček (renamed Steven Konichek in the credits by Deitch to avoid being linked to Communism) and Václav Lídl (renamed Victor Little) with vocal effects mostly provided by Allen Swift. The team had only seen a few of the original shorts and was working on a significantly smaller budget of only $10,000, resulting in their shorts being regarded as unusually bizarre. 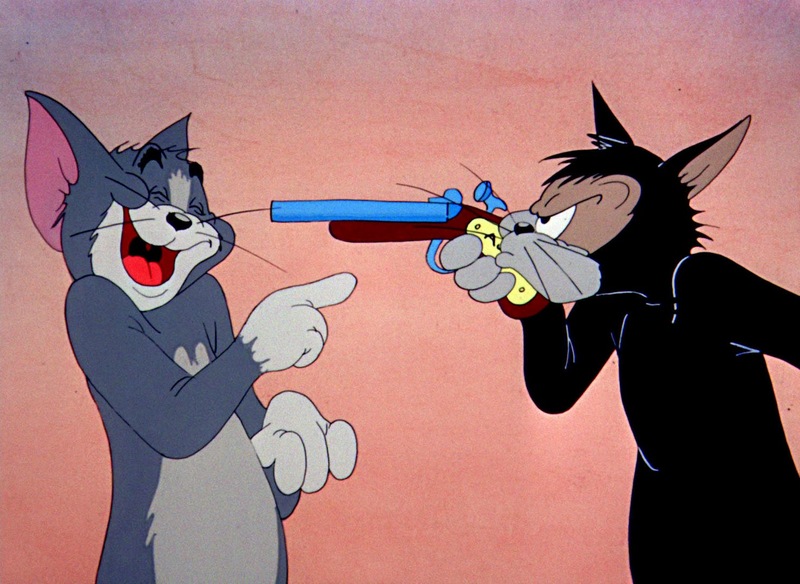 Tom’s threat to Jerry was diminished by a new grumpy, middle-aged man who would frequently punish Tom brutally for the pair’s antics. The character motions were also performed at high speeds, resulting in motion blurs rendering the animation choppy. When the shorts were completed, head of production John Vogel was fired from MGM and the studio opted not to renew Rembrandt’s contract. 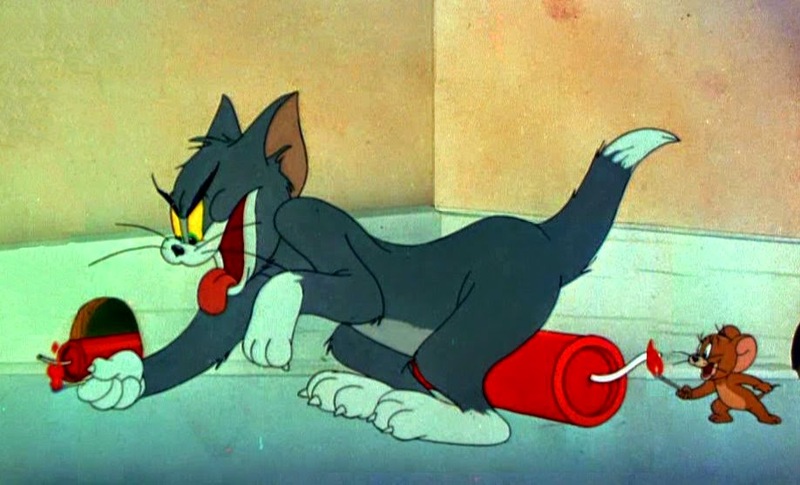 Jones-era Tom and Jerry in his distinctive style. Although they were unfavorably reviewed and failed to win any awards, the Deitch cartoons were a commercial success. In 1963, MGM made another attempt by hiring Chuck Jones to produce more shorts. Jones had just been fired from Warner Bros. Cartoons and formed his own studio, Sib Tower 12 Productions, with partner Les Goldman. Tom’s design was tweaked, giving him thicker eyebrows and furrier cheeks, sharper ears, a longer tail and a new gray-colored coat. Jerry’s ears and eyes were increased in size, his fur became a lighter brown, and he was given a sweeter facial expression. Jones co-directed most of the 34 shorts produced with layout artist Maurice Noble, infusing his own style of comedy (with some difficulty) into the classic formula. Abe Levitow and Ben Washam directed several of the others, while Tom Ray directed two shorts using footage from the original series. Mel Blanc and June Foray, who followed Jones from Warner Bros., provided the vocals used. Jones’ most notable contribution was the new opening for the shorts, in which Tom replaced the MGM lion and then became trapped in the “O” of his name. MGM, who had purchased Jones’ studio and renamed it MGM Animation/Visual Arts, ultimately ceased production on the series in 1967 and closed the studio entirely in 1970. The chase continues on the small screen. Despite no further theatrical shorts being made, Tom and Jerry still had some mileage to go on television. Specifically, on Saturday mornings.